It is, by turn, scholarly, dramatic, challenging, prophetic, practical, intensely personal and yet with implications which, if taken seriously, could transform the whole field of counselling and psychotherapy. Therapists' provision of positive regard is strongly indicated in practice; at a minimum, it provides the basis for other mutative interventions. Or at least a desire to understand further some of the more complex sides that at times we all might have in line with our experiences. 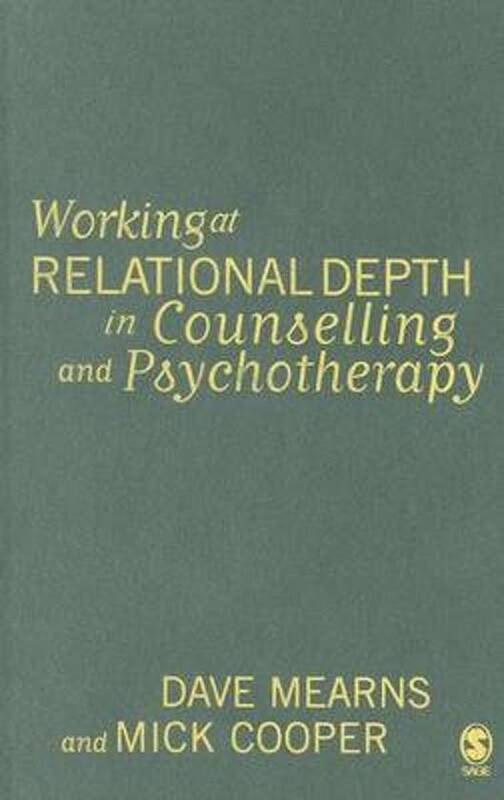 The authors powerfully combine vivid case material and careful conceptual analysis to examine different aspects of relational depth and to show how it may be facilitated, and weave in a fascinating discussion of the interaction between therapeutic context and the types of relationship that can be created between therapist and client. Its starting point is that therapy aims to help clients move towards the things they most deeply want. Where are more people like this. Focusing on the concept of 'relational depth', Dave Mearns and Mick Cooper describe a form of encounter in which therapist and client experience profound feelings of contact and engagement with each other, and in which the client has an opportunity to explore whatever is experienced as most fundamental to her or his existence. Using in-depth cases, the book provides detailed guidance on how this framework can be applied. It integrates concepts and practices from a range of approaches to therapy, and offers a convincing and original perspective that has the potential to inform practice, training and research for many years to come' - John McLeod, Professor of Counselling, Tayside Institute for Health Studies, University of Abertay Dundee Dave Mearns is formerly Director of the Counselling Unit and Professor of Counselling at the University of Strathclyde, Glasgow. Through the discussing and setting of goals, clients develop a deeper insight into what it is that they really want in life: a crucial first step towards being able to get there. Although deeply influenced by person-centred theory, the authors draw their arguments from a wide range of approaches and systems within contemporary psychotherapy. It also raises disturbing questions about many current trends both in society at large and in the profession of counselling and psychotherapy itself. The structure of the chapters makes sense, and gives the reader a building base of knowledge as well as the pinnacle of the presentation of the two main case studies, one of which Rick I found incredibly moving. This book stands as a landmark. The workshop combines self-development exercises, theoretical input, practical exercises, and small and large group discussion. But what is the client's experience? Dave Mearns is Professor of Counselling, University of Strathclyde. 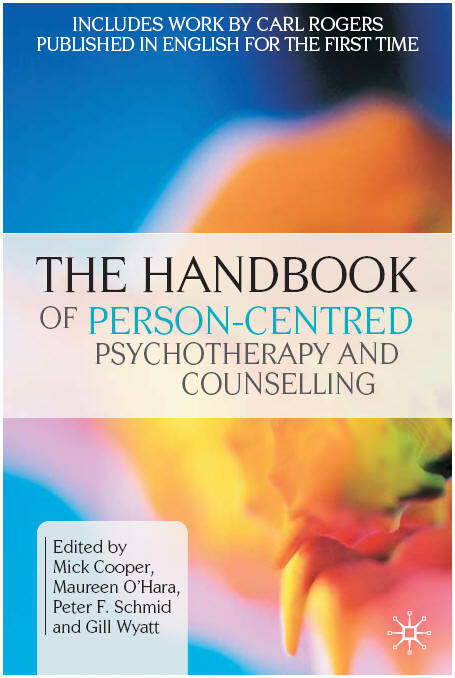 The subject of the book is of enormous interest and importance within and beyond the person-centered and experiential orientations in the whole field of psychotherapy and counselling, both in its practice and its theoretical development. Through small group exercises, pairs-work, discussion and theory input, the workshop will help participants develop a deeper understanding of such encounters, and also how they come to deepen their levels of relating in their therapeutic work. Somebody needed to write a book such as this. Journal of Humanistic Psychology, 49 1 , 85-99. This reader experienced them as human beings from their introductions in the preface. About the workshop What does it mean to connect to others in an in-depth way? This is a book which has about it an inspirational quality which will leave few readers unmoved. Somebody needed to write a book such as this. The book is of enormous international interest; not only the international perspective on literature and development in the field, but also the cross-links of different views contribute to the development of psychotherapy and counselling and will be fruitful for interdisciplinary dialogue. One of my real issues through the years has been many people unwilling to share true experiences and 'technique', making counselling approaches out to be somewhat magical and elitist but I've been fortunate enough to cross paths with some excellent academics, counsellors and psychologists who have provided me with a damn good grounding and pointed me in the right direction. I highly recommend this book for anyone with an interest in learning how to accept individuals and their many parts on any level. More than that, it makes research findings accessible and provides information on how to practice counselling and psychotherapy in an effective way. 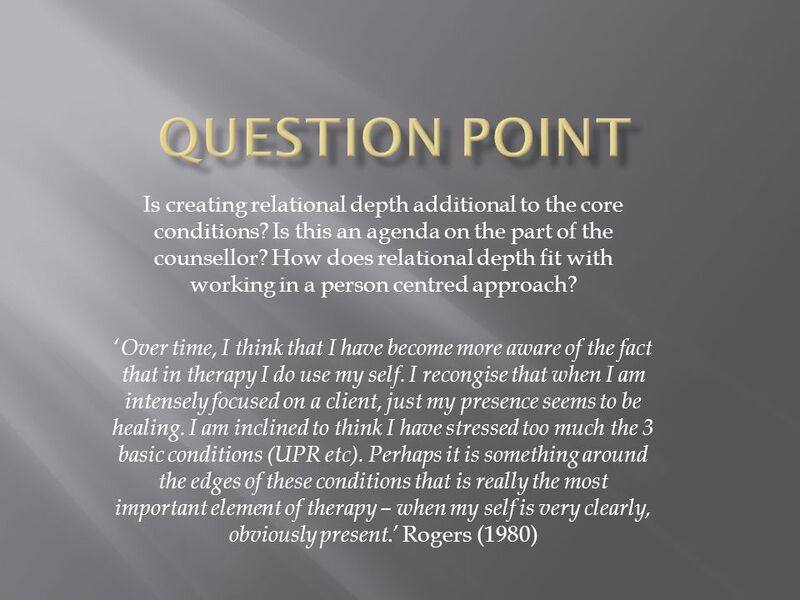 Working at Relational Depth in Counseling and Psychotherapy is a groundbreaking text which goes to the very heart of the therapeutic meeting between therapist and client. Recent policies in both child and adult mental health services have supported the use of goals in therapy. This workshop will give participants an opportunity to explore their experiences of relational depth, and how it feels to meet others at this level of intensity and intimacy: in both their therapeutic practice and everyday life. Two powerful case studies - a client with a drink problem and a traumatised client - have been selected to illustrate key aspects of working at relational depth. The venue is less than 5 minutes from junction14 M1. Focusing on the concept of 'relational depth', Dave Mearns and Mick Cooper describe a form of encounter in which therapist and client experience profound feelings of contact and engagement with each other, and in which the client has an opportunity to explore whatever is experienced as most fundamental to her or his existence. 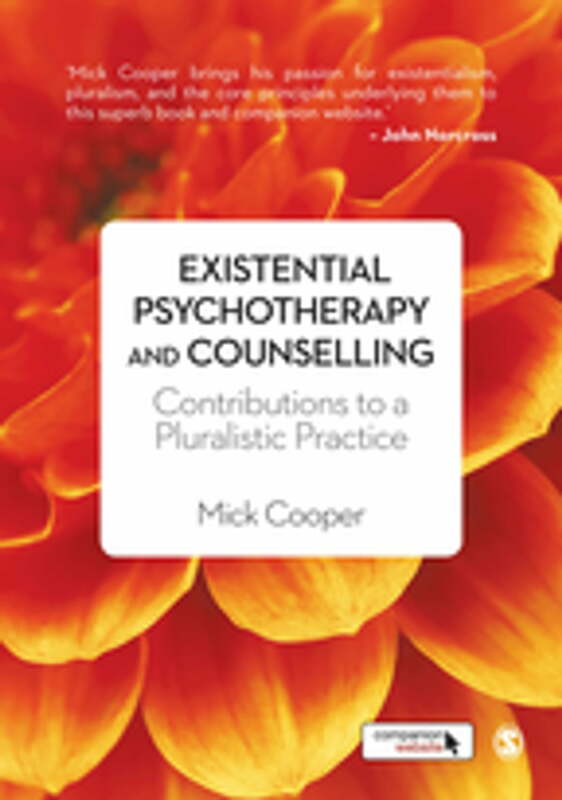 In this book, Dave Mearns and Mick Cooper provide a fresh and challenging new perspective on the therapeutic relationship. Mick is the father of four children and lives in Brighton on the south coast of England. It also raises disturbing questions about many current trends both in society at large and in the profession of counselling and psychotherapy itself. Two powerful case studies — a client with a drink problem and a traumatized client — have been selected to illustrate key aspects of working at relational depth. Leading experts in the field take you through the latest research findings in child and adolescent therapy, discussing how each is relevant to the work of practitioners. The authors powerfully combine vivid case material and careful conceptual analysis to examine different aspects of relational depth and to show how it may be facilitated, and weave in a fascinating discussion of the interaction between therapeutic context and the types of relationship that can be created between therapist and client. This model breaks away from the orientation-specific way in which counselling has traditionally been taught, reflecting and responding to shifts in counselling and psychotherapy training. How important is the relationship? The workshop combines self-development exercises, theoretical input, practical exercises, and small and large group discussion. The book presents, accessibly, the current best knowledge and its implications for practice. Like many of the ideas discussed in this book, the case studies represent a challenge to conventional thinking about the therapist-client relationship and the nature of the therapeutic process. It integrates concepts and practices from a range of approaches to therapy, and offers a convincing and original perspective that has the potential to inform practice, training and research for many years to come' - John McLeod, Professor of Counselling, Tayside Institute for Health Studies, University of Abertay Dundee Working at Relational Depth in Counselling and Psychotherapy is a ground breaking text, which goes to the very heart of the therapeutic meeting between therapist and client. By exploring the meaning, challenges and experiences of relational depth, it provides insight into an important dimension of therapeutic practice and, for many, will act as a guide to new ways of thinking about their therapeutic relationships. Person-Centered and Experiential Psychotherapies 9 3 : 236-256. 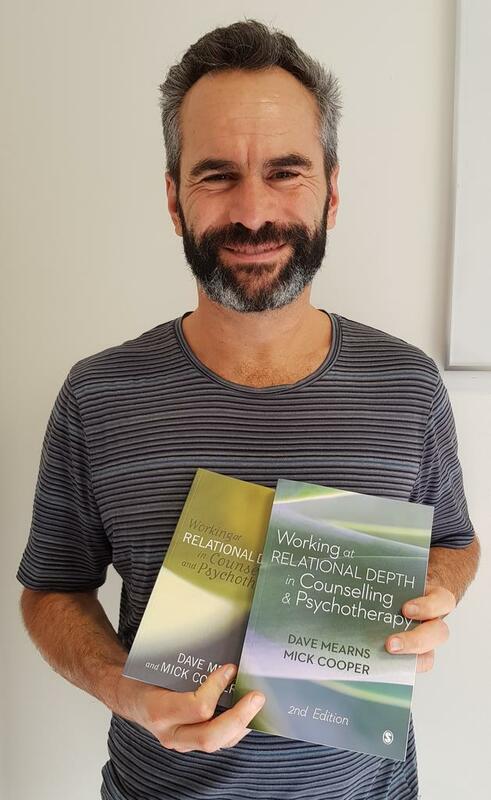 Mick Cooper co-authored the book Working at Relational Depth in Counselling and Psychotherapy with Dave Mearns, a text that was met with wide acclaim in the field of counselling and psychotherapy, engaging with an experience recognised by many practitioners as both transformative for the client and deeply meaningful for the therapist. It presents an existential, phenomenological, dialogical approach at its best, and highlights the power of encounter relationship. Counselling and Psychotherapy Research, 5 2 , 87-95. I picked this up as the Mearns and Cooper approach is a part of my Diploma course, so I felt reading this would be a good idea to get a handle on what I'm going to be doing, and not only am I glad I read the book, I'm also very excited for the course. Participants were asked to focus on specific moments which they had experienced as relational depth.